NOTE: Please select desired holster type, color and size above. If you already have a holster and prefer to use your own with your new Vehicle Handgun Mount select “no holster” in all three boxes above to purchase the Vehicle Mount only. See holster details below for more information. Quick and accessible, our universal steering wheel column mount is ideal for carrying a handgun in your vehicle for convenience or self-defense. 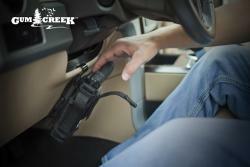 Great for those who often conceal carry and may not want to keep their pistol on them while driving. Also popular for those who travel or as a self-defense system for situations where a weapon is desired to be in immediate close reach. No more shoving a handgun between seats, placing under a seat, in a door, on/in a console, or in any other area that is uncomfortable, unsafe or non-secure. Simply use one of our Gum Creek Vehicle Mount Holster's (select size above) or any common type of holster you may already own**. Install the mount directly into the gap below your steering wheel column and secure at the bottom of the dash/kick panel. Release mount in seconds to securely put away if desired. This product is not vehicle or firearm specific. One size fits all. Length adjusts from 6¾” - 13½”. Color: Black. Made in USA. Lifetime Warranty. Patents 9,010,600, D734706. To view and learn more about our Standard Holsters, click here. Our Concealed Vehicle Holster was made for those customers who live in or travel through a state requiring that the firearm be concealed while in the vehicle. Depending on individual preference, this option is also great for those who desire their weapon be less visible under the steering column. Made in USA and comes with Lifetime Warranty. * Mount will fit most vehicle applications. Please verify you have both a gap under your steering wheel column and at least a few inches or more of lower dash area just above your pedals. This is ideal for a more perfect fit. If you do not have a gap or have an odd design, we recommend our Universal Vehicle Mount Adapter. In rare cases, we also do not recommend this product if you have an air bag located below the steering column. 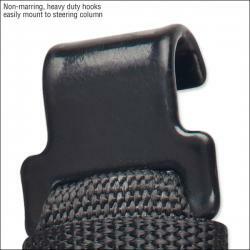 ** Works with most belt loop or belt clip OWB holsters (generic hip nylon holsters, OWB kydex holsters such as BlackHawk!, Fobus, SafariLand, etc. Paddle holsters are not recommended.) You will need either an ambidextrous OWB holster or opposite side draw OWB holster as it will wrap around the mount. Holster should have belt loop in the center of the holster side. Holsters with dual loops or snap loops (ie. pancake or wide MOLLE style holsters) are not recommended. You are responsible for knowing state laws regarding firearm carry in your vehicle. Gum Creek is not responsible for any legal issues that could arise from the use of this product. This includes firearm reciprocity, transporting, loaded/unloaded carry and open/concealed carry laws. We highly recommend having a State Firearm's License and to check your laws if you are unsure. Gum Creek is not responsible for any injury or death that may occur from the use of or while this product is in use, any improper handling/use of your firearm(s) in conjunction with our products or any possible scenario's resulting within your vehicle due to an accident, theft, arrest, discharge, etc. We also do not recommend using this product if your vehicle has airbags located in direct proximity to where the product is to be located. Gum Creek cannot assume or take responsibility for ones intention of buying our product or for how one may or may not use safe and responsible gun control measures. Use at own risk.